We [me and companions] are staying on this isle. The coast is rocky, the water blue and warm. The colors are muted, not brilliant, not grey but somewhere in between. We are staying at this retreat type house with lots of people for a specific purpose. That purpose is to ride the ocean tornadoes. 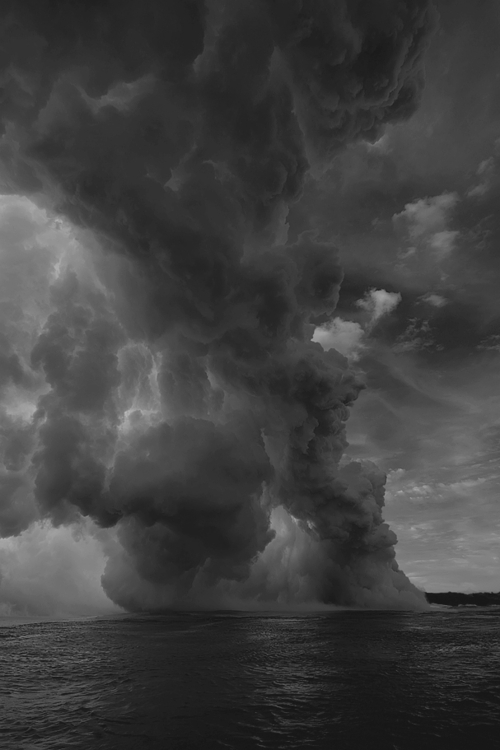 The sea rises to meet the clouds to form this water tornado, huge, epic and vast. I mean like miles and miles wide. And it is our goal to windsurf them! We paddle out on surfboards and at this point in the sequence I can't tell if I've ridden them myself or if I'm experiencing someone else's memory, you know how dreams can put you into another consciousness briefly? So I'm able to feel the tilting of the board as it catches the whorl ridge of the tornado and my body is tilting left as it spirals up this gigantic storm. The catch is you have to get out of the whirl before you reach the clouds and then you ride the wind drafts back to the ocean. But I, myself, can never get there. We go in pairs and my partner is this girl that I was paired with at the house. She is determined to go. Not squeaky excited but resolved that it WILL happen. Iron will, stoic. But I puss out every time... sitting in the ocean watching my companions one after the other confront their own storm. I paddle back to the coastline to use the bathroom. I sit on the pink fluffy toilet seat in the wood paneled cramped bathroom surrounded by bad floral curtains. I look at myself in the mirror, angry and scared. I go back outside to face my companion who is annoyed. We paddle out again... each and every time I sneak back to the awfully decorated bathroom. I wander the empty halls of the beach house. I never ride the storm. Glass Vaults is the answer. These beats are the key. * I wrote the above to my best friend without any guile. It is pure unadulterated chat. This is me sharing with you. Sharing with love, with the understanding we have dreams and sometimes they stop us in our tracks.